4-year-old Evelyn Verdejo, not only won the hearts of students at Bakersfield Christian High School, but she also won the title of “Girl of the Year” in 2018 when she was chosen by the Leukemia and Lymphoma society’s Bakersfield chapter after surviving blood cancer. BAKERSFIELD, CALIF. — When Catelyn Verdejo found out that her daughter had cancer, she says she didn’t know what she was going to do. 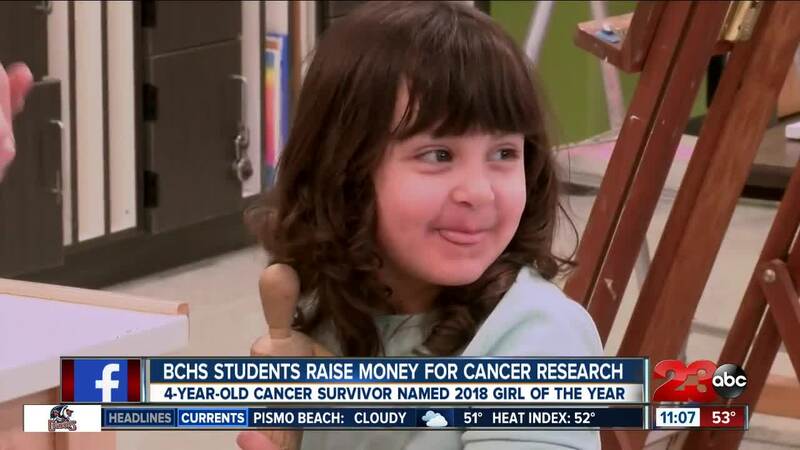 With the help of the Leukemia and Lymphoma society as well as students at BCHS, things have turned around for her bubbly 4-year-old, Evelyn Verdejo, who won the title of “ Girl of the Year ” in 2018 after surviving blood cancer. “At first I felt like I had no one but now this has been amazing,” said Catelyn Verdejo. The Stand Up to Cancer club at BCHS is currently raising money for leukemia and lymphoma research through the organization’s 2019 Student of the Year competition. “It’s a seven-week campaign and it ends on February 22 with a grand finale so right now we’ve been looking for sponsorships, auction items, donations …” said sophomore Emma Wilson, a 2019 Student of the Year candidate. The students say that Evelyn has changed them just as much as they’ve changed her. “I never thought I’d be able to experience such a joy just from meeting her and seeing her and seeing how we can help her,” said Wilson with tears in her eyes. “The fact that I’ve never had to go through that and she has and just seeing how strong she is, it just really gives a whole new perspective,” added sophomore Lauren Buetow, 2019 Student of the Year candidate. Evelyn is now out of treatment. Her mother says she hopes that her daughter will grow even stronger. “I hope she remains healthy and strong and that she just keeps thriving,” said Verdejo. She also encourages other parents who are going through her situation to stay strong and never give up. “Don’t give up. just keep going. Even when it’s hard, it will get better,” said Verdejo. The students will be fundraising until February 22, culminating at a grand finale celebration. The students who raise the most money will be crowned “students of the year”. You can donate to their fundraiser here .